Public assistance needed. Attempt to identify/provide information regarding a robbery. See attached. 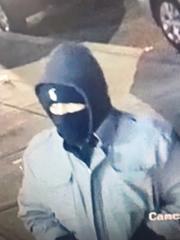 The Asbury Park Police Department is seeking information and/or assistance with identifying a subject involved in robbery. 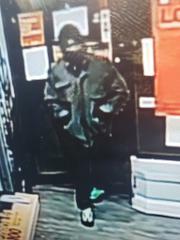 On Tuesday February 19, 2019 at 735 pm, units from the Asbury Park Police Department were dispatched to the Boost Mobile Store located at 615 Main Street, due to a robbery that had just occurred. The victim reported that the accused male entered the store and while providing a bag to the victim, demanded currency from the registers. The accused advised the victim that if they did not comply, he would shoot them. A weapon was not a shown. The accused then fled the store with the proceeds, south on Main Street. Attached are images of the accused. He is described as a Hispanic or light skin black male, wearing a black ski mask bearing a white symbol, black hoodie, gray zip up jacket, dark colored pants and black and white sneakers. Anyone who may be of assistance in identifying the accused or may have witnessed anything while in the area at the time is asked to call the Asbury Park Police Department at (732)774-1300.